Help is always close to Home when it comes to our Prince Edward County Memorial Hospital. Picton Home Hardware owners Adam and Chrissy Busscher made a significant donation to the ‘Back the Build’ PECMH redevelopment campaign this week, presenting $5,000 to Prince Edward County Memorial Hospital Foundation officials late last week. 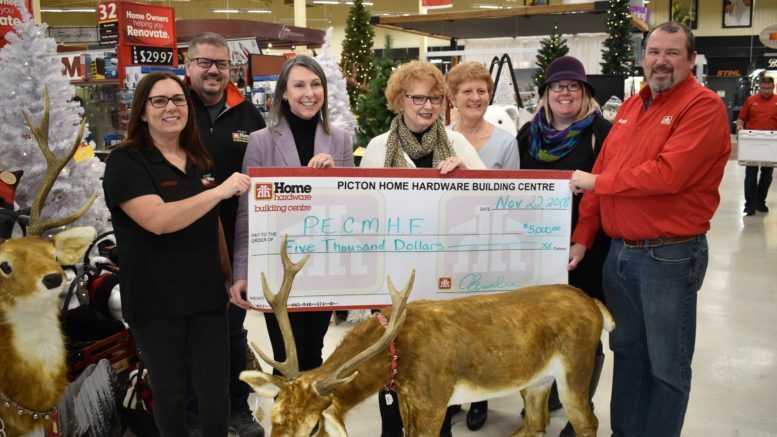 These funds were raised at the Picton store’s recent customer appreciation evening held Oct.25 where 210 ticket holders were privy to in-store specials, games and snacks all provided by Home Hardware. Over $2,400 was raised from the ticket sales and a raffle that was directed to the Back the Build campaign and customers Sheila Brushey and Paul Vidito helped make it an extra special night for the Foundation as they graciously donated their winnings back to Home Hardware to be put towards the Back the Build contribution. The remainder of the funds received by the Foundation on Thursday were collected at recent electronics recycling events held in the store’s parking lot. The Busscher family extend thanks to e-waste co-ordinator Linda Ryan who organizes the recycling events held at Home Hardware. In total, the Foundation has raised $10.4 million of its $16 million goal as the community’s contribution to the redevelopment of PECMH and Foundation Executive Director Shannon Coull said community-minded donations, bequests and other commitments are edging the new hospital to the goal inch-by-inch. In total, the campaign seeks funds for the build ($12.7 million) as well as outfitting the redeveloped facility with new equipment that will replace medical capital expenditures that are either to old or can’t be removed from the current facility. The cost of medical equipment is expected to be around $3 million. Reaching the campaign goal years prior to the estimated project completion date of 2025 will send a message to the Ministry of Health and Longterm Care that this community is ready for a new hospital.